Map of Pomerania. 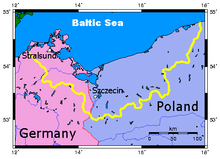 Poland and Germany are seen, Pomerania is marked by a yellow line. Pomerania (Pommern in German, Pomorze in Polish) is a region on the Baltic Sea. It is now part of two countries, Germany and Poland. 20,000 years ago the territory of present-day Pomerania was covered with ice, which did not start to recede until the late period of the Old Stone Age or Paleolithic some 10,000 years BC, when the Scandinavian glacier receded to the north. Various archaeological cultures developed in the Mesolithic, Neolithic, Bronze Age, and Iron Age. Since around 500BC and before 500 AD Pomerania was dominated by East Germanic tribes including several tribes of Goths, who according to archeological evidence and their own tradition have come from Scandinavia. Goths and Rugians are recorded by Roman historians in the areas of Pomerania in 98 AD. The Veneti, non-Germanic tribe, which later assimilated with Slavs, are recorded by Ptolemy and Pliny the Elder around Vistula in first century AD. By the 7th century Slavic tribes (Wends) such as the Pomeranians settled the area. Pomerania was first conquered by the Polish duke Mieszko I in the second half of the 10th century. Pagan uprisings in 1005 and 1038 resulted in independancy for Western Pomerania and Pomerelia, respectively. Regained by Poland in 1116/1121, the Polish could not hold the Pomeranian duchy longer than 1135, whereas Pomerelia after the 1138 partition of Poland among the sons of Boleslaus Wrymouth became a part of the Polish seniorat, which was declared fief of the Holy Roman Empire in 1156. The Western part, the Duchy of Pomerania, was declared part of the Holy Roman Empire (1181). After a brief period of Danish rule (1168/1186-1227), it remained part of Holy Roman Empire of the German Nation until 1806. 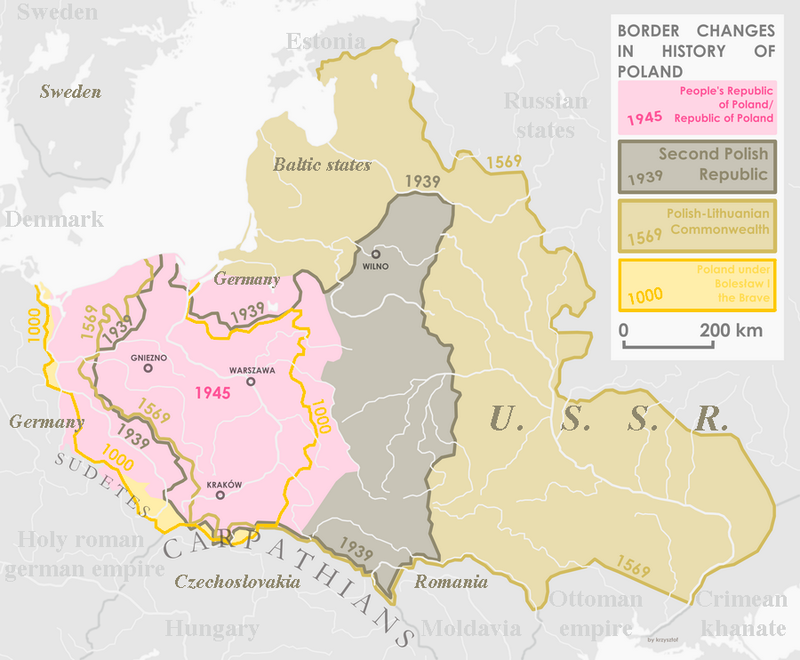 ↑ Map of Poland before the fragmentation period.